This Cresson gem is worth the trip. In the world of destination food joints, most gas stations don’t cut it. But there are exceptions. 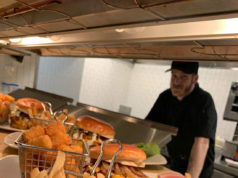 Chef Point Cafe in Watauga serves up some fine cuisine inside of a Conoco. Tiger Farms Market on Wilshire Boulevard in Burleson might be the best place to buy road trip food in Texas. And then there is BBQ on the Brazos, located at a Texaco station on Highway 377 in Cresson, which is definitely a destination worth the trip. As soon as you enter the small two-floored restaurant — there are three tables downstairs and another seven or eight upstairs — the smell of the meats enchants you. My guests included three adults and three kids: 9, 7, and 5, all girls. They’re a tough crowd for anything but roast chicken and rice with lime juice. It didn’t take long to win over these finicky eaters. 9001 E Hwy 377, Cresson. 817-396-4758. 6:30am-3pm Mon-Fri, 9am-3pm Sat. All major credit cards accepted. We started with a couple of two-meat plates –– one had brisket and ribs, the other was piled high with pulled pork and beef sausage. For good measure, we ordered a side of jalapeño sausage and a dish called Chili Trash. Each plate comes with two sides, and we opted for mashed potatoes, pinto beans, Brazos slaw of red and green cabbage, potato salad, and an extra side of mac ’n’ cheese. The portions of meat were large enough that, despite six people sharing, we didn’t see the bottom of a single plate. Every morsel that crossed my lips was outstanding. The pulled pork was juicy and flavorful and better eaten with your fingers because it falls apart so easily. The ribs were done perfectly –– light on smoke, full of their own flavor with a zesty, sweet, and smoky rub. The two sausages were distinctly different, but each had some zest: The beef meat tube had a nice peppery after-bite, and the jalapeño danced on the back of the tongue. 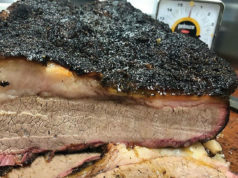 The star of the show was the moist, succulent brisket. It was fatty where it was supposed to be, seasoned with a peppery rub, and so good that one of the adults took an extra two plates home with her for days of sandwich making. The sides stood out on their own. The mashed potatoes were buttery with bits of brisket speckled throughout. The red and green cabbage slaw was crisp, light, and had a touch of vinegar. The potato salad was a delight, with mustard notes and a touch of minced greens — probably celery and a hint of pickle — giving it a slight crunch. 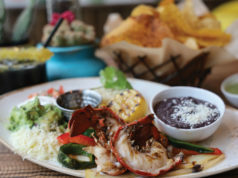 The rich, flavorful beans could have been a separate meal. The Chili Trash was a comforting treat: flour tortilla pieces covered in a light chili made with ground brisket and topped with cheddar and peppers. The only issue the adults had was with the mac ’n’ cheese, which felt too light and airy — the young ladies thought it was the best they’ve ever had. In fact, the girls thought everything was great except for the jalapeño sausage. “Too spicy,” they cried. 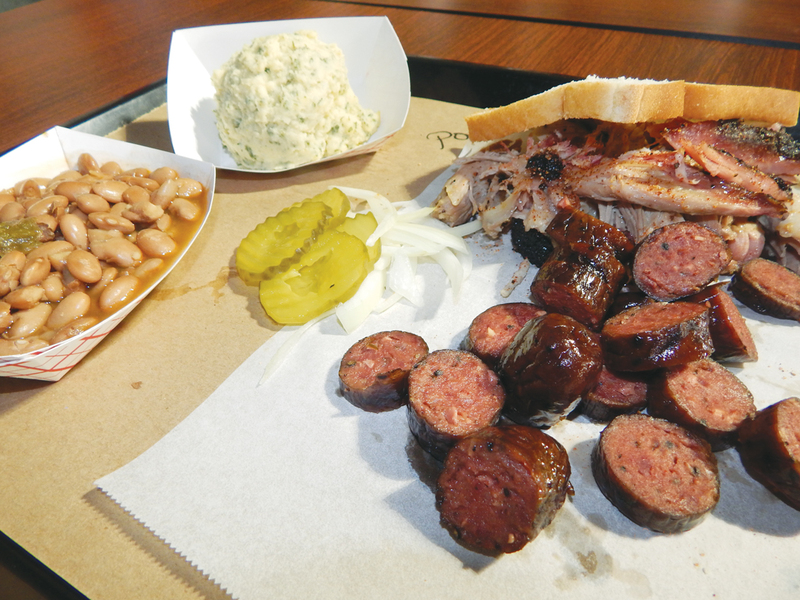 BBQ on the Brazos is going into its fourth year in January. It’s owned by John and Kathryn Sanford, the latter of whom was behind the counter taking orders and helping to make food when we visited. She seemed to know nearly all of the other clients — and there was a steady stream of them. For good reason. It was damned good eating. You should try the Hickory Tree in Burleson some time. Pulled pork stuffed potato skins are too die for. Everything I’ve tried has been delicious. Fresh never frozen. I always love reading good food reviews, then followed up by someone trying to jump in and pimp their brother-in-laws place. If Hickory Tree was so good, you need not trash another mans review to try and sell it. The food and publicity obviously need a little help, hence you posting here. BBQ on the Brazos is a great place…if you can get past the owner’s ugly mug.